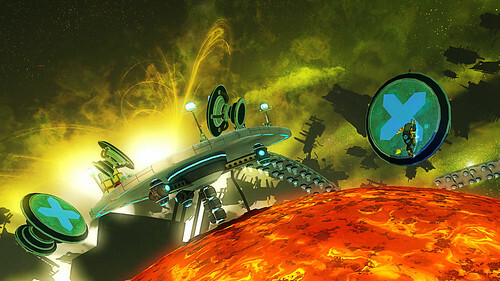 ‘Discovery Package’ – Explore the Insomniac Moon with a special level that resembles the layout of Insomniac Games’ studio offices. A fan favorite, the Moon is filled with content that didn’t quite make the final game, sort of like deleted scenes on DVDs. You can earn this unlockable on your own, but Insomniac certainly won’t make it easy for ya! ‘Power Package’ – Up your arsenal with an exclusive weapon skin for one of Ratchet’s weapons along with extra hit points and Ratchet’s brand new Cryo Mine Glove. ‘Bolt Package’ – Bolster your bolt count with 5,000 free bolts care of Ratchet’s most bolt-centric power-ups, the Bolt Magnetizer and Box Basher. For those of you attending PAX this week, a quick reminder to stop by the Unicorn Theatre on Friday, September 4 from 1:30-2:30 p.m. You’ll be treated to a panel presentation by Insomniac’s Creative Director Brian Allgeier on the history of Ratchet & Clank weapons, as well as the unveiling of a few new ones. Also, make sure to tune into GTTV on Spike this Thursday at 12:30 am for an all-new special cinematic unveil. For those who miss the show, check it out this weekend at GameTrailers.com. We have a lot more in the pipeline for the weeks ahead, so please stay tuned! Will the game have a street date? I believe when Ratchet & Clank Future: Tools of Destruction came out retailers were able to sell it when they got it because there was no street date…or am I remembering wrong? Eww are all games gonna look like that at the top from now on? That looks awful. new box art style? I like it! Another change in the PS3 game box art template. Game looks good though. Just not the cover art. There was an error with the box. But to clarify – there is no multiplayer. RCF:ACiT has always been planned to be a single-player experience. I kinda like the new cover art. Please Insomniac Games and Sony, you guys have decided to bring out a God of War collection. PLEASE can we see a Ratchet and Clank collection as well for the PS2 Ratchet and Clanks? From a PS3 owner who never got to experience Ratchet and Clank. That would be a day one buy for me. I like the new box art temple but not the game cover. Hey I noticed that on the top of the back cover there a description of the features and among others there is a “playstation home”. What is the connectivity between the game and playstation home? SWEET BOXART!!! (Yes, it’s that awesome that I had to yell). new skin for my avatar – woohoo! btw, the new PS3 logo is LAME! it looks bland as far as design, actually, GENERIC is more like it. I have a question, is all the new games from now on will have this new boxart style? e.g. like Uncharted 2, God of War Collection, God of War 3…. etc. & many others? I’m waiting for the inevitable DLC announcement that screws gamers, just like every other game this gen. Wait, the Insomniac Moon level will be available to all, but has to be unlocked, like in the old R&C games? The Insomnic Moon is available currently as a pre-order, but will also be unlockable for those who want the challenge. Can’t wait for this game but I really don’t like the cover art… Liked the one on Amazon.com a lot better. I notice the PSN logo is featured fairly prominently on the box. What PSN-related features will the game have? Who the hell would waste their time at the lamest game show of all? So for true fans who want everything. You can’t. 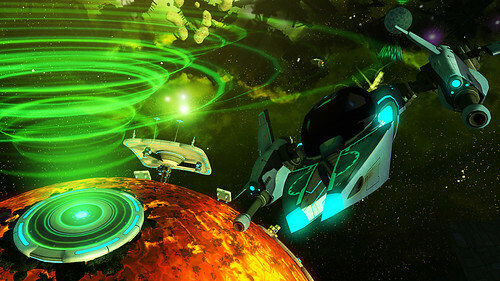 The Space package gets you the Home avtar skin everyone wants, and you can earn the Insomniac Moon on your own. So which retailer has the Space package? Don’t ever do something retarded like this again Insomniac. You have a repuation of being one of the coolest and fan friendly developers in the world. Pre-order BS like this will put an end to that rep. Though, i have to admit, I’m not a fan of the DLC pre-order bonus (not just these, but in general for all games). Not saying the DLC isn’t cool, but personally, I like real-world items. Any chance there will be a special edition or collectors edition with some cool extras? 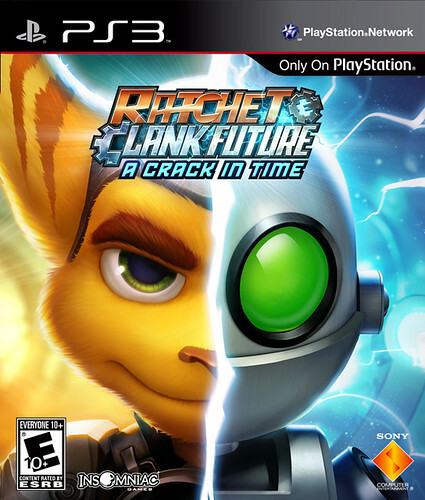 Is the gray outline on the side and bottom just part of the Ratchet and Clank box art, or is that something that is going to be on all new games that use this style? Should have been called “Clock Blockers” like they were going to. “A Crack in Time” doesn’t have the same innuendo/ring to it as “Up your ARSEnal”. Still, anticipating this game’s release. I just enlarged the cover art and answered my own question about the PSN features; Multiplayer, Leaderboards, Lobbies/Matchmaking, Invite In Game, PlayStation Home, Trophies. It would still be nice to know which retailers get which bonus though. Wow love the packaging. I love the fact sony went back to the original PS themed names with PS3, the spidey font was cool though, they could have kept the spidey font with just PS3. Now can we please get the mobile site back up for iphone? I don’t like the whole ‘only on Playstation’ tab going on there. I also hate Matchmaking like no tomorrow. Also, I like the name of the creator of this blog post. Definitely looking forward to this, and having a date makes it even better. Can’t wait to check out the space exploration! First the PS logo doesn’t rotate and now this. Do Sony not get what matters to gamers? oh no please, that’s the new game covers format! NO! SONY DONT DO IT!, please reconsider it, don’t do this to your loyal fans that had their PS3 since the beginning, also, it looks horrible. Please sony don’t dissapoint me, or at least make the covers double sided or something so we can use the original format. Oh no, my boxes aren’t going to match anymore!!! Oh well, I do like the new style and the cover art. All these kids do on the forums is cry. “I don’t like the Playstation 3 name, why not PS3′, sony changes it to PS3 they complain again. It will never end. Sony should make a 21+ forum or something, maybe we can deter the immaturity. Box art looks great. I doubt this game has multiplayer, there’s no way they could’ve managed to keep that under wraps all this time. All of you who are whining like little girls need to get a life. Everything looks great, I will definitely be buying this!